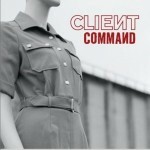 Client (officially stylised as CLIEИT) are an English electronic musical group fromLondon. They are most popular in Germany where they have had limited commercial success. They typically combine airline hostess uniforms or shiny fetish fashion outfits with glamour-girl aesthetics and harsh electronics to create a sound reminiscent of early forays into electronic sound manipulation and New Wave. Their uniforms have become their trademark.